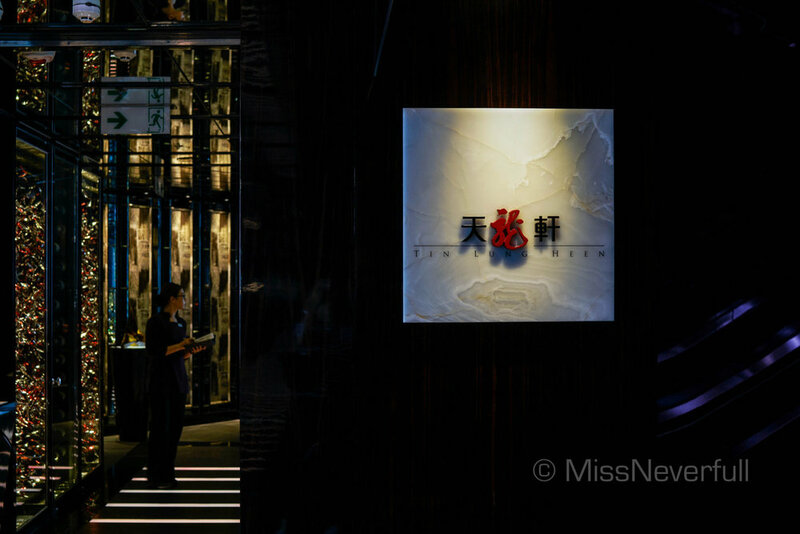 The last stop of this Hong Kong food trip was at the highest Chinese restaurant in the world - Tin Lung Heen, a Michelin two star Cantonese restaurant on 102F of Ritz Carlton Hotel in Kowloon, Hong Kong. 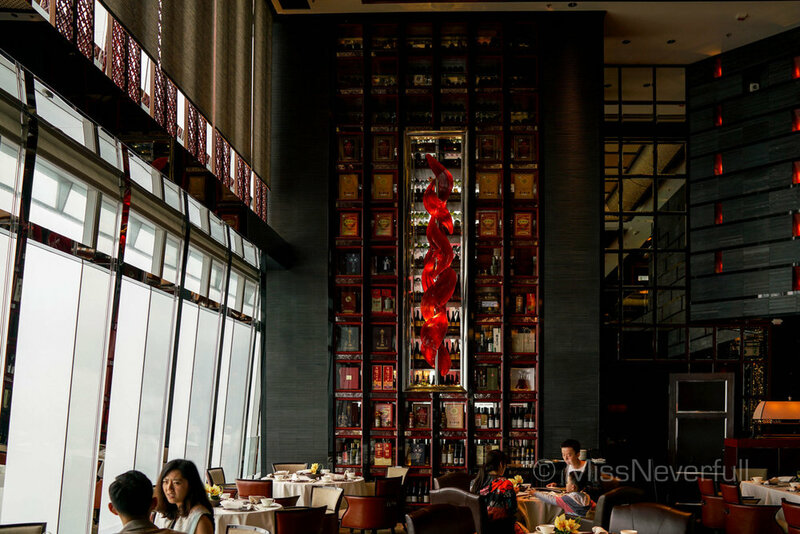 As one of the finest Cantonese restaurants in Hong Kong, you will be impressed by its spectacular view from the floor-to-ceiling glasses once you step into the restaurant. 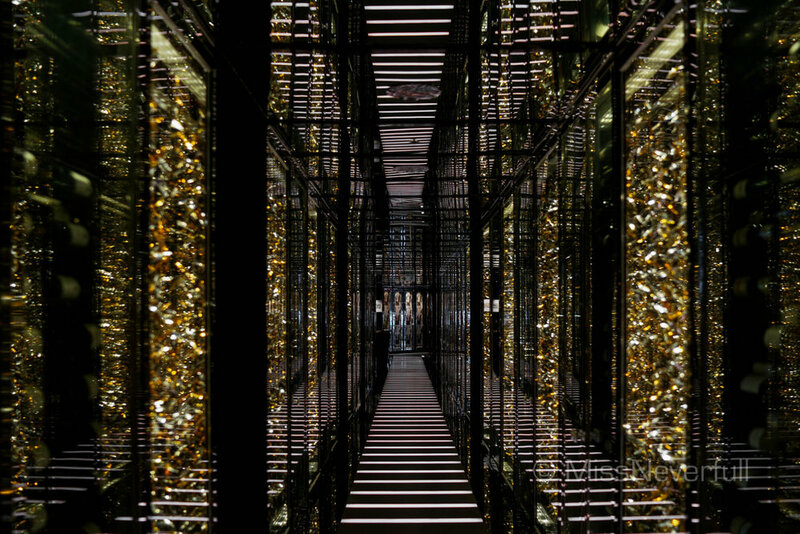 The elegant decor as well as the impeccable service too give a nice first impression. 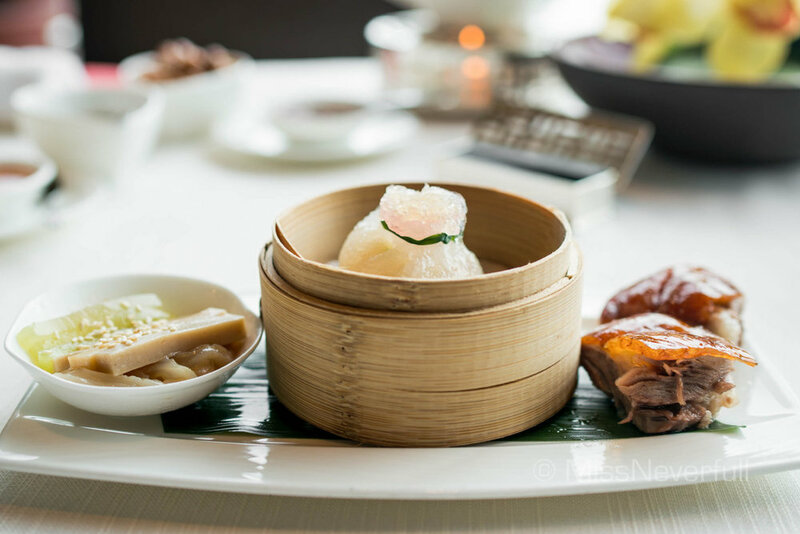 Tin Lung Heen offers a wide range of traditional Cantonese dishes as well as dishes with chef's unique creations. 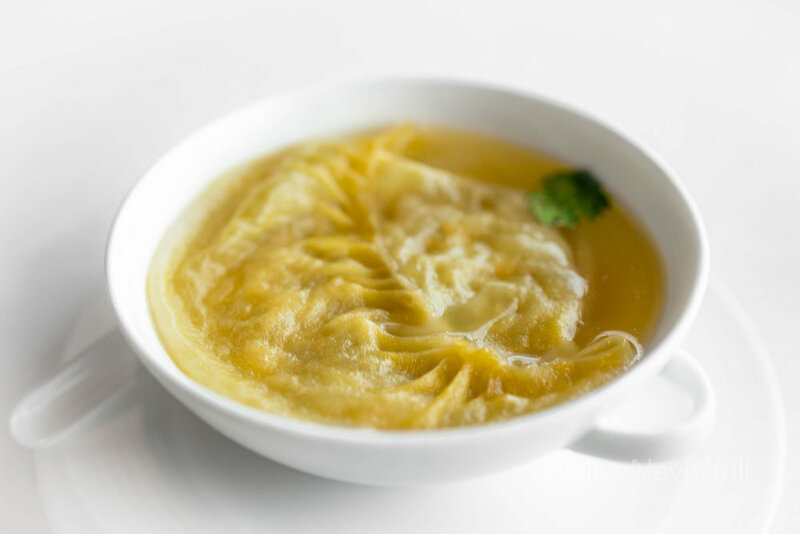 Tin Lung Heen is currently helmed by Executive chef Paul Lau Ping Lui, who is an expert in Chinese culinary arts with over 36 years of experience in Beijing, Shanghai, Hong Kong and Guangzhou, as well as in Dubai and UK. Dim Sum chef Chi Hang Wu also has a strong background who've been worked in culinary industry for 17 years (2016'). 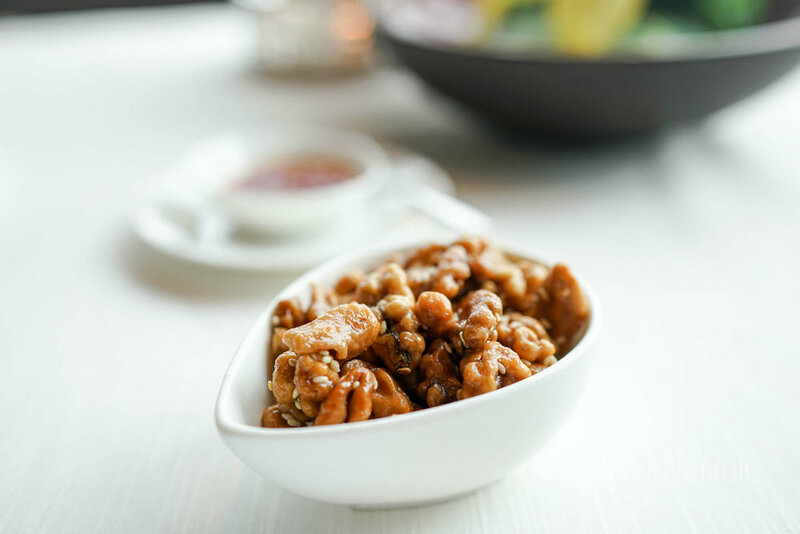 The meal kicked off by serving a snack of roasted walnut with glazed honey. 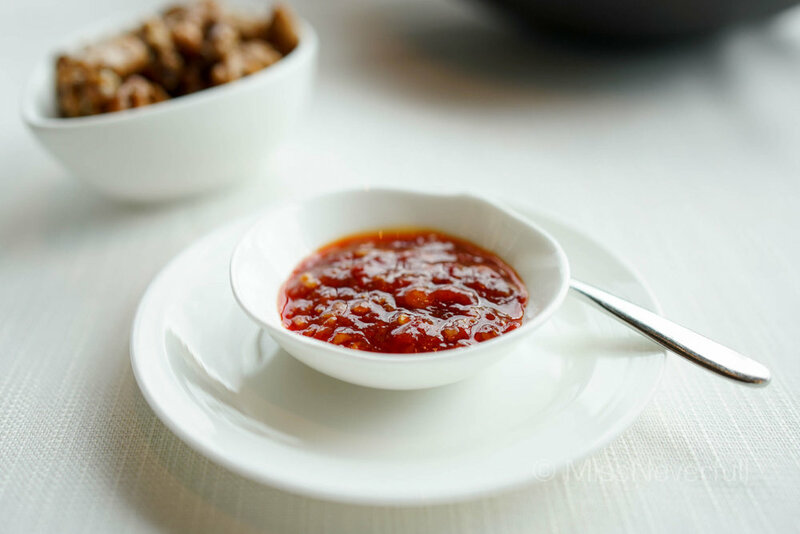 On the side, chili sauce was served for guests who prefer bolder flavours. 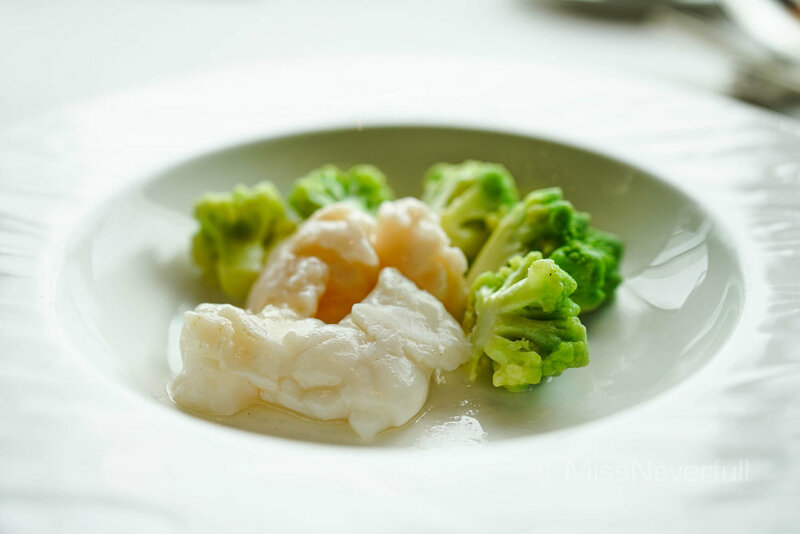 Har Gau (shrimp dumpling) as a symbol of yum cha has a pretty crystal skin, by which you can even see the large shrimp inside. The skin could be thinner while the umami tastes and bouncy texture made it up. Followed by the abalone puff with roasted goose, which reminds me of Lung King Heen's abalone puff but differently, this one was with roasted goose in the center instead of LKH's chicken. The tart base was soft and buttery which works well with the whole abalone and flavourful goose inside. I like to in general, but some how lack of depth. Although i prefer roasted goose over chicken for most of the time, i still prefer LKH's abalone puff. Each of us had an appetiser & dim sum platter too. My partner loved the prawn dumpling, it was quite large and nicely steamed, very bouncy and flavourful. Unfortunately, mine steamed crab meat dumpling was lack of flavours and the skin was too thick. Arguably the most famous dish at Tin Lung Heen, the barbecued Iberian pork (蜜燒西班牙黑豚肉叉燒) was gorgeous. The char-grilled pork was very tender and flavourful. My favourite roast goose, was however under-expected.Its skin was crispy while the fat contents made it a bit oily. For the main dishes, the lobster was well-sauteed with an incredibly tender texture and oceanic flavor. I was quite surprised that the braised pork belly is a signature dish here because it is actually origins from Hangzhou in mainland China. As a girl who grows up in this dish's hometown area, the braised pork was honestly succulent and the flavour goes through the entire large meat very well, while it was too salty for our liking that we didn't even finish 1/6 of it. It was sent back to the kitchen at last, the manager kindly removed it from our bill. But i am pretty sure it goes better with white rice. I favorite vegetable dish in Hong Kong is sautéed Kai Lan (chinese kale) with HKnese sauce of ginger wine, the kale was at it finest quality and processed very well. Simple is the best. Finally a satisfying ending with everyone's favorite chilled mango cream with sago and pomelo, side with deep-friend sesame rice ball which was not oozing but the flavourful salted egg yolk made it up. 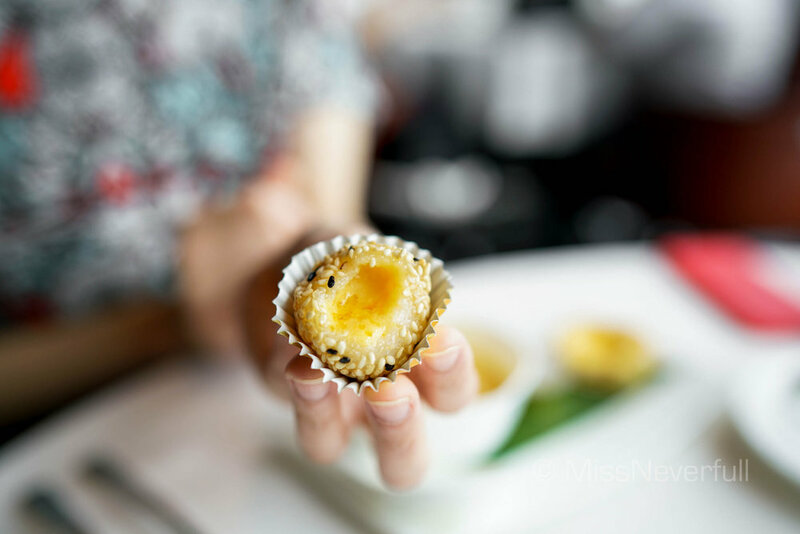 The traditional baked egg custard tart has a flaky tart based and incredibly silk and smooth egg custard in the center which we enjoyed a lot too. Each of us got a small box of home-blended tea, a lot of thanks to the entire team for the wonderful service and delicious food. 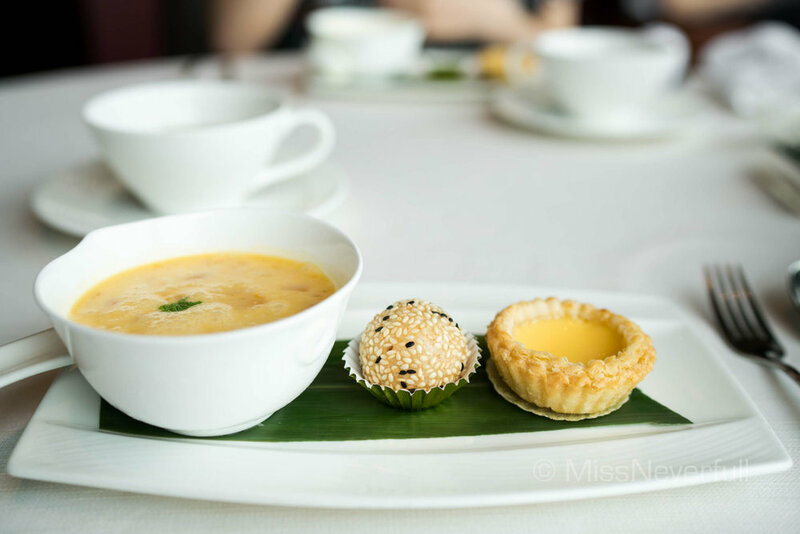 Our dining experience at Tin Lung Heen was good overall, dishes were flawless while few items have room for improvements. While to be honest, among other Michelin-starred Chinese restaurants i have been in Hong Kong, I still prefer Yan Toh Heen (my favourite), Sun Tung Luk and LKH. But Tin Lung Keen is definitely with a visit for its impeccable service and settings, and the food was not bad.